Soapboxmom, shipdit, Char and 2 others like this. Soapboxmom, path2prosperity, shipdit and 4 others like this. littleroundman, path2prosperity, shipdit and 1 others like this. "This case is being investigated by Department of Homeland Security, Immigration and Customs Enforcement, Homeland Security Investigations, Washington Field office. It is being prosecuted and investigated by Assistant U.S. Attorney Zia Faruqui and Arvind K. Lal, Chief of the Asset Forfeiture and Money Laundering Section. Assistance has been provided by Assistant U.S. Attorneys John P. Marston and Diane Lucas; former Assistant U.S. Attorney Catherine K. Connelly; Paralegal Specialists C. Rosalind Pressley and Toni Donato; Victim/Witness Advocate Yvonne Bryant; Document Management Analyst Basizette Stribling; Legal Assistant Jessica McCormick; and Litigation Technology Specialists Ron Royal and Joshua Ellen"
Soapboxmom, path2prosperity, shipdit and 1 others like this. Soapboxmom, EagleOne, path2prosperity and 5 others like this. shipdit, Char, Fat City, LA and 2 others like this. EagleOne, shipdit, Joe_Shmoe and 4 others like this. Or e-gold, emopay, etc. What I don't get is why it took so long to bust AlertPay/Payza. For several years Patel has openly appeared with ponzi scammers, recruiting their business and aiding them on money laundering. Very blatant. Of course, Ragnarok/Budovsky had the same pitch with Liberty Reserve, but he wasn't running around in public or taking photos about it. He just first relied on their old contacts he laundered money for in the past and took it from there. Took the feds around 5 yrs to bust LR which was doing a whole lot more financial maneuvering offshore than Patel attempted, and it took around 10 years to get AP/Payza busted. S-L-O-W. I remember when Charles Scoville was telling how he only moved TM's PayPal money to his personal bank account so he could then move it to TM's Payza account to surprise TM members with early payment. He had lied telling them the PayPal funds wouldn't be released until August 11, when he knew all along it was going to be July 11. He bragged how he had met with Firoz Patel and Firoz said he would help him and bent over backwards to get things done much quicker than it would normally take to set up TM's account. Bet Charles won't be telling about this in his oral argument today in the Appeals Court hearing. Soapboxmom, Whip, shipdit and 4 others like this. 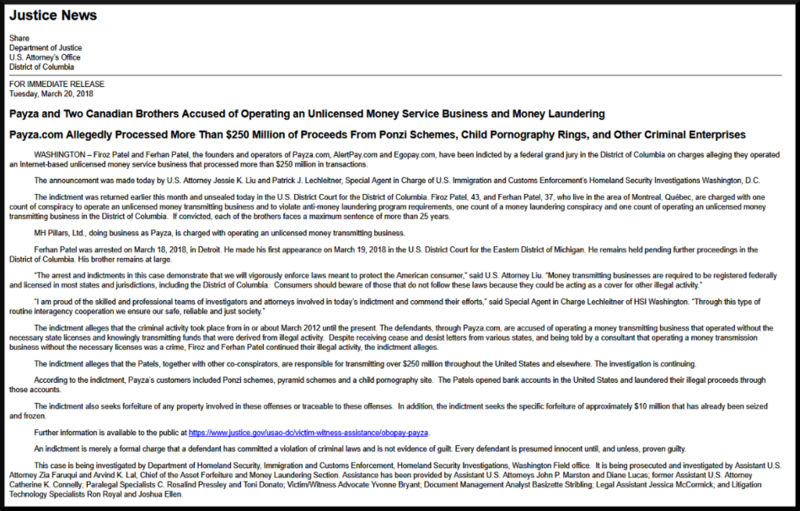 "US authorities have seized the Payza and AlertPay websites, as part of forfeiture in a $250 million money laundering case filed against co-founders Firoz and Ferhan Patel." 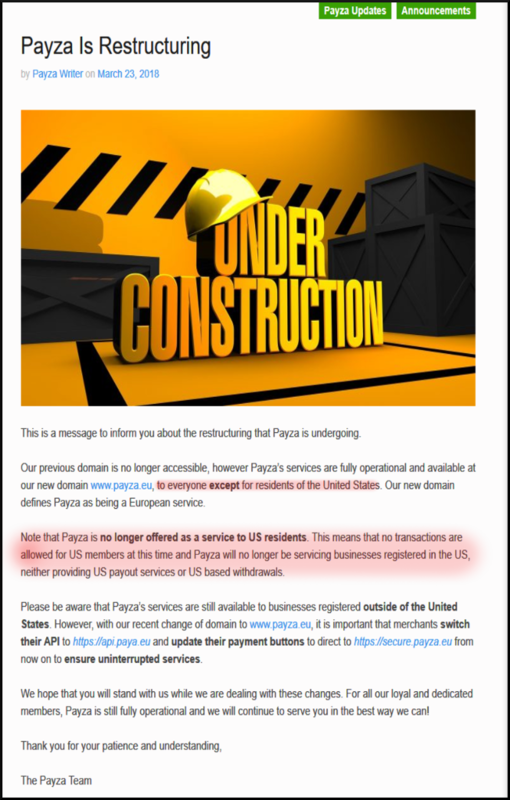 "Within 24 hours of the Department of Justice and Homeland Security seizing Payza’s .com domain, the payment processor reemerged on a .eu domain." How are Payza continuing to provide payment processor services? Why would they write to a little customer like Chirley Scoville? shipdit, Char and Bestbud like this. shipdit, Char, Fat City, LA and 1 others like this. "As one of its operators sits in a Michigan federal prison and the other is listed “at large” by U.S. authorities, Payza today announced a purported “restructuring” as a “European service” that has ceased serving U.S. customers." "The latest move by Payza co-founder and fugitive Firoz Patel, has been to terminate payment processor services to US residents. It appears now, like Patel, Payza itself is on the run from US authorities." "Following his indictment earlier this year, Payza co-founder Firoz Patel went into hiding. Now, if a June 12th Facebook status update is to be believed, Patel has resurfaced in Quebec, Canada. "After roughly ten months of being a fugitive, Firoz Patel is turning himself in."